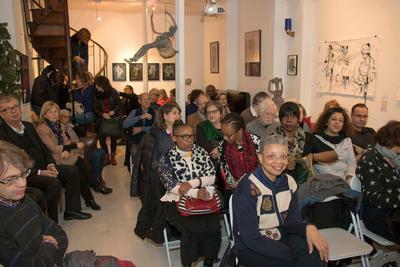 Dorothy's Gallery is celebrating Black History Month with a two-part series of events called "Black Voices in Paris." 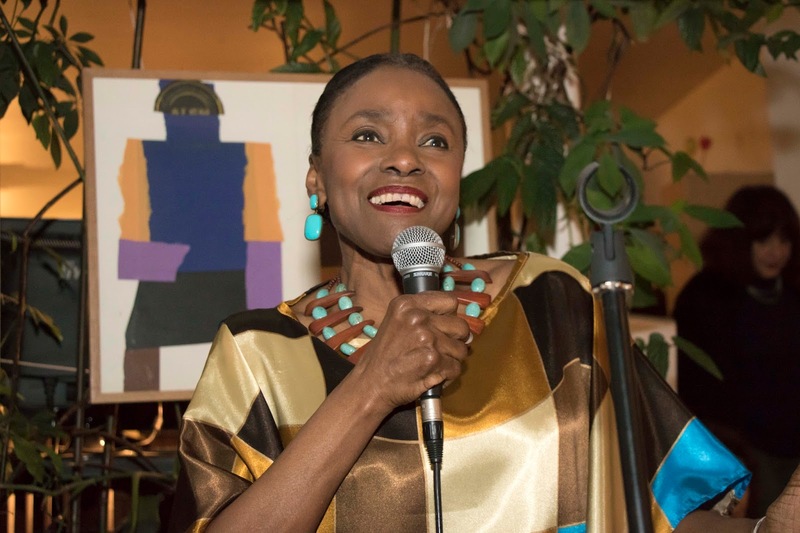 The first event, which took place on February 17th, featured historian and writer Curtis R. Young presenting “When the blues people sang America,” followed by a concert of jazz, blues, and gospel music by Ursuline Kairson. The house was full when Polley took the floor to welcome attendees. 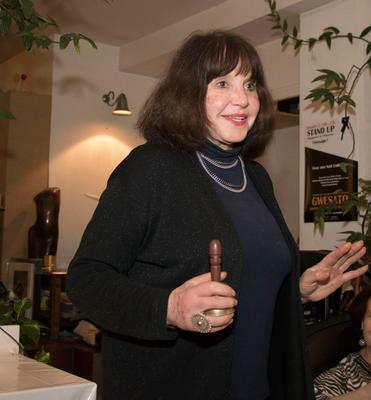 She explained that she has delegated the curatorial responsibility for the gallery to Olivier Sultan of Galerie Art-Z so she can focus solely on organizing cultural programs. This month's Black Voices in Paris events are the kickoff for a series of diverse, exciting programs called "United Voices," which she will organize throughout 2017. In France and the U.S., we are actively building a network of artists, activists, and the public of all ages ... joining together the many groups that exist, and encouraging new voices. 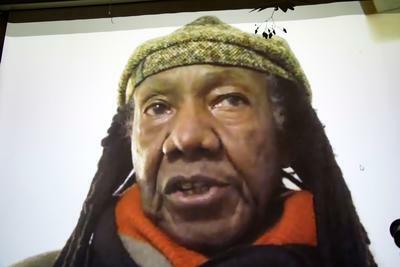 Curtis Young gave his presentation remotely via Skype (the method by which future speakers will be able to speak directly to event attendees from the U.S.). He talked about Lt. James Reese Europe and the 369th Infantry Regiment, emphasizing the musical genius of Europe and the manner in which the regiment took France by storm in World War I through military prowess and the introduction of jazz to the French population. Following Young's talk, singer Ursuline Kairson regaled attendees with jazz, blues, and gospel songs. In keeping with the spirit of the evening, she performed many numbers whose lyrics spoke of freedom and tolerance. The audience gave her and her guitarist, Thierry Paul, a rousing ovation at the end of the evening. 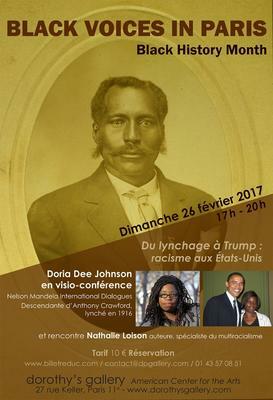 The second "Black Voices in Paris" event is entitled "From Lynching to Trump - Racism in the United States." Doria Dee Johnson, an historian specializing in African-American 20th century culturee, will deliver this presentation remotely. Her work is intricately linked to her family history - her great-great-grandfather, Anthony Crawford, was lynched in Abbeville, South Carolina in 1916. This event is scheduled for Sunday, February 26 at 5 PM. For more information, contact the gallery by phone or by e-mail (see below).